Statistics for Business & Economics, Revised 12 Edition STATISTICS FOR BUSINESS AND ECONOMICS Revised 12e brings together more than twenty-five years of author experience, sound statistical methodology, a proven problem-scenario approach, and meaningful applications to demonstrate how statistical information informs decisions in the business world. Discover how the most trusted approach to statistics today is Simply Powerful with the latest market-leading text from respected authors Anderson/Sweeney/Williams/Camm/Cochran. STATISTICS FOR BUSINESS AND ECONOMICS Revised 12e introduces sound statistical methodology within a strong applications setting. The authors clearly demonstrate how statistical results provide insights into business decisions and present solutions to contemporary business problems. New cases and more than 350 real business examples and memorable exercises, 150 of which are new in this edition, present the latest statistical data and business information. With this book's comprehensive coverage and unwavering accuracy, you select the topics best for your course, including thorough coverage of the latest versions of MiniTab 16 and Excel 2013, along with StatTools and other leading Excel 2013 statistical add-ins within chapter appendices. Author-written support materials and CengageNOW online course management system provides time-saving, complete support to ensure student understanding. 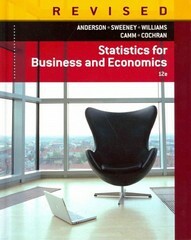 Choose Anderson/Sweeney/Williams' STATISTICS FOR BUSINESS AND ECONOMICS Revised 12e for the Simply Powerful statistical solution you need for your course. Available with InfoTrac Student Collections http://gocengage.com/infotrac.